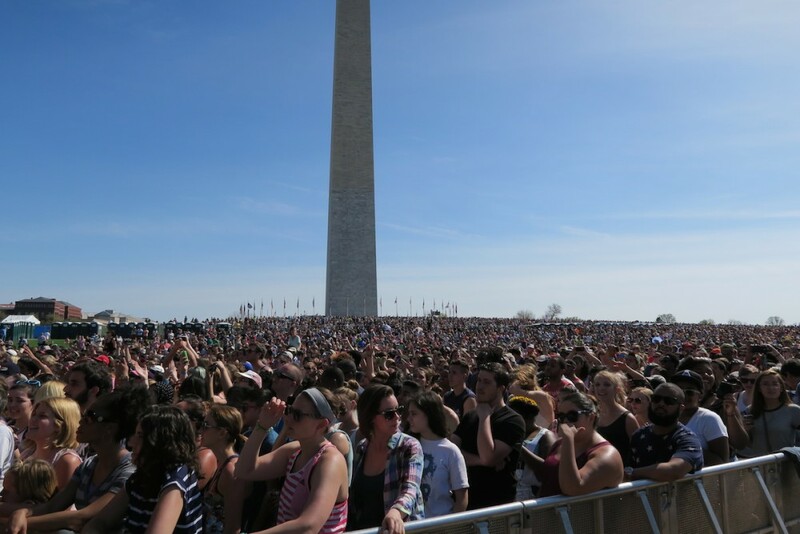 Thousands of people flocked to the National Mall in Washington, D.C., Saturday, April 18, to celebrate the best weekend weather so far, and to attend the Global Citizen 2015 Earth Day concert. 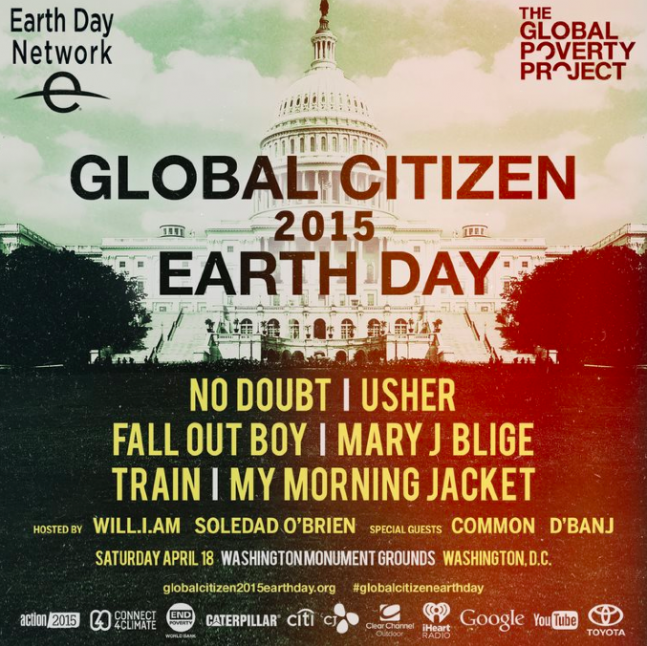 The star-studded event featured performances by artists such as Mary J Blige, Train, Fall Out Boy, No Doubt, My Morning Jacket, and Usher. Between sets, ministers from countries including Germany, Belgium, and Denmark delivered impassioned pleas for those gathered to pressure their elected officials to tackle the world’s most pressing issues, including climate change, poverty, and childhood education. The event also included recorded messages from a number of top American legislators and officials, including Secretary of State John Kerry. 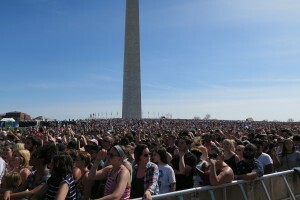 NASA, too, was among the prominent voices at the performance. Astronaut Scott Kelly delivered a recorded message from the International Space Station. His message was to educate Americans about NASA’s extensive contributions to the study of Earth science and global warming research. After the video, NASA Administrator Charles Bolden delivered a short speech with much the same message, to remind those gathered that space is a fundamental frontier not only for exploration outward, but for understanding our own planet. In 2014, NASA announced one of the most expansive Earth science agendas in almost a decade. NASA was also one of only a handful of organizations to be represented in the small cluster of pavilions nestled next to the Washington Monument. An inflatable domed Earth housed a small staff of NASA media and communications personnel from headquarters and nearby Goddard Space Flight Center in Greenbelt, Maryland. A table of giveaways, including bags, pins, and puzzles, explained the profusion of children running around the National Mall with NASA paraphernalia clasped in their hands or on their apparel. Prominent inside the ‘Earth’ was a 1:32 scale inflatable model of NASA’s new heavy-lift Space Launch System (SLS) rocket. At ten feet tall, the imposing model is a reminder of the immensity of the SLS project, which an SLS project representative said will eventually stand at 320 feet (97.5 m). On the opposite end of the display, a team from NASA’s Visualization Explorer (VIZ) App stood by a television screening their latest stories. The team produces bi-weekly content, released every Tuesday and Thursday mid-day, heavily focused on making data easy and interesting to visualize. The app is available on the iTunes store for IOS devices. Throughout the pavilion, NASA representatives stood huddled over speaking to enraptured children. To them, during an afternoon punctuated by world-famous performers, they could have been rock stars too. @TOM, you wouldn’t be so sad about what NASA is doing if you were to examine the atmospheric science more carefully, and critically review the real climate change propaganda that is published by the fossil fuel interests and their paid shills. But instead, they sure do have you fooled. IMA Thinker, It’s hilarious how the people who have bought into this climate change bunk label those of us who know the truth as fools. In reality, your the one who has drank the propaganda Kool-Aid, do your research, even some NASA scientist has come out this past week and admitted there research has been manipulated to promote the lie.